In this post I will re-examine another common “fact” about Sears homes that is frequently mentioned in the media, in books, and on internet sites. "Increasingly complex house designs, the Great Depression, and federally sponsored mortgage programs (FHA) were the three primary reasons that Sears closed their Modern Homes Department. " "In the 1930s, during the Depression, the housing market took a sharp downturn, and by 1940, Sears stopped selling kit homes, as many people had lost their jobs and defaulted on their loans." These two explanations are cited again and again as the reasons Sears stopped selling houses. Now let's take a closer look at the facts. Sears actually stopped selling houses in 1942, not 1940. However, many websites and books state that the Modern Homes business was irreparably suffering and "dwindling" by 1940. That is patently false. In 1940, residential construction in the United States was booming and re-approaching levels experienced during the 1920's. I made this chart using data from the United States Department of Labor statistics. It doesn't look like the residential construction market was on the decline in 1940. In 1940, the Sears Modern Homes department had 16 district sales offices and 120 salespeople. In 1939 Sears sold about $7 million in houses ($117 million in today's dollars). Those numbers mean that sales were not stalling or "dwindling". Sears stopped offering home financing way back in 1933. Foreclosures from a decade earlier had nothing to do with Sears exiting the business in 1942. The Federal Housing Administration (FHA) was created in 1934 and it set standards for new residential construction. The Sears models were "well within FHA requirements", according to Sears press releases, and meeting these supposedly "complex" housing standards clearly was not a problem for Sears. Reassurances from the 1940 Sears Modern Homes catalog. "It's one thing to meet requirements, but it's a better thing to exceed them!" So much for the complexity. These explanations for why Sears stopped selling houses are nonsense. Hmm. Let me think. What was happening in 1942 that would affect the housing industry in the United States? War preparations got underway in earnest in 1940 and the demand for lumber exploded. Lumber production increased in 1939, 1940 and 1941, but orders were in excess of output. In 1941 the Supplies Priorities and Allocations Board issued the L-41 order curtailing ''nonessential" construction. This order meant that new residential construction was permitted only for workers in the defense industries like shipyards and tank, aircraft, and bomber plants. L-41 certainly crippled the Sears Modern Homes business. We have some documentation to support this ruling's effect on the Sears Modern Homes business. In 1941, Sears had planned a housing development in Briarcliff Manor, NY. In October of that year, the company had to refund customer deposits because they were unable to source the lumber they needed. The lead paragraph says it all. Andrew Mutch located this news article from October 1941. Consequently, in late 1941 and early 1942, Sears mainly sold kit houses for worker housing developments in Ohio and New Jersey, among other places. 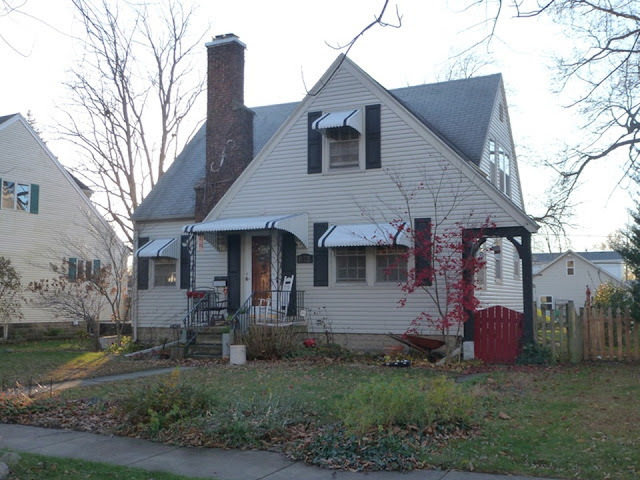 675 S McKinley Ave., Kankakee. This is an authenticated Sears Yates built in early 1942. Kankakee was home to the Kankakee Ordnance Works which produced TNT for the war and other chemicals. This Yates could have been classified as worker housing. Photo from Realtor site. In 1942, the government called the need for lumber "critical". In May of that year, the U.S. government took control of all lumber mill sales and deliveries. This would ensure that there would be an adequate supply of lumber for military purposes. It's hard to sell houses when you can't get any lumber. So our answer is simple: Sears stopped selling houses because of the government's regulation of resources during WWII and the national restrictions on construction materials. 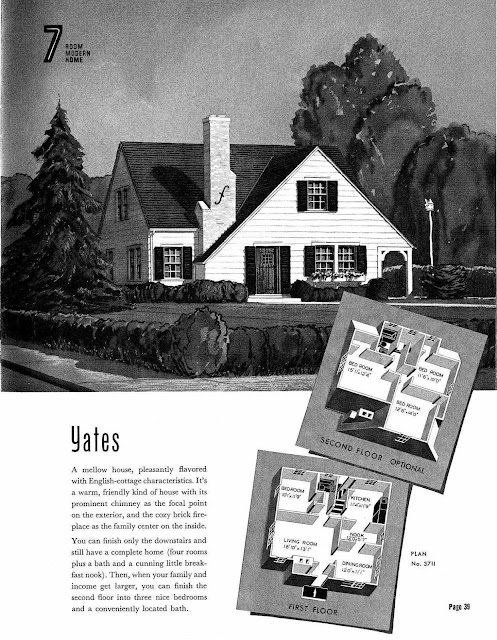 After the war, Sears re-entered the housing business in 1946 when they introduced Homart Homes. I found this interesting and also went to your link about the Homart Homes. You see, I was born in 1953 and in 1955 my father designed and built our small home that he built in Medway, Ohio. He built it from stick and although I don't remember him building that house because I was only two, I do remember him working on other homes during my preschool and elementary years. It was his weekend job as he sold insurance for Prudential. He had a distinct disdain for prefab homes, as if they were inferior in quality. However, at the same time, I think my mom's sister's family, the cousins I grew up with, lived in three different kit homes. I don't believe any were Sears, but as I read, it fits. I really enjoy learning about all these homes and I am interested in ALL architecture in general, but these wonderful (if kept up) homes are fabulous. They sure weren't made for old ladies who need double knee replacement surgery though! Fabulous information. Nothing I like better than research facts presented with sources to back them up. Excellent, as always! Denise, you're right in that there was a stigma against prefabricated houses. In my town they were banned after WWII because they were deemed too "low class". Sears would state in their ads that their houses were NOT prefabricated just in case anyone wasn't clear. Prefabricated homes really got a bad rap. Excellent! I too am also quite fond of articles that are actually backed up with verifiable facts that are easy to confirm and difficult to argue against! After looking at the houseplan for the Yates, I noticed something that may have caused some of the features to be built at different times. At some point early on, among myriad other restrictions on construction of Defense Worker homes, all were restricted to one bathroom per structure, or individual residence in the case of multihome buildings, due to the severe restrictions on the productions of bathroom fixtures, primarily steel and cast iron bathtubs. The Yates shows two, one up and one down, so I would imagine the one downstairs would have been completed first, with the upstairs space allowed, and constructed, and possibly the plumbing stubs roughed in for future use after the War. Many substitutions were proposed and some employed, such as shower stalls that didn't include much, if any, metal, but also included ALL TILE tubs composed of ceramic tile squares mortared in to a rectangular box - tub-shaped - in a hopefully waterproofed base! That one didn't get very far, but I have some wartime issues of American Builder with an article or two proposing the possibilities, and detailing the construction if things got exceptionally tight with priorities and restrictions. It was a really difficult time for construction, as a development could be granted all the priorities it needed to get it up and running, with one minor exception - one that allowed the extension of utilities from the main power lines into the development by virtue of severe restrictions on materials needed to extend the actual physical power lines from the main street into the development and thus into the individual homes! Copper and steel were extremely short in supply for civilian use of any kind (remember steel pennies from the 40's? They needed the copper that badly!) and the necessary materials to make the actual power lines were frequently unavailable. Or the paperwork bogged down that allowed that part of the work to commence! There were numerous instances of developments being completed and ready for occupancy, with the single exception of the complete lack of power to any of them. People were so desperate for housing though, that they moved in anyway, and took lanterns, candles and oil lamps for lights, heated with the fireplaces, if it was the season for it, which quite a few did include as an alternate means of heat with special venting, and cooked on camp stoves! And plenty of people are very familiar with the Post-War Levittowns which lit the fire under suburban developments, but few are familiar with their Wartime Defense housing production. Among other work, in 1941, the Levitts won a government contract to provide 2,350 housing units for defense workers in Norfolk, Virginia. (They even incorporated their company in the State for the time they were doing business there, since they were based in New York.) Part of this is still extant, and is called Oakdale Farms. If I recall correctly, this portion was built for Navy Officers and their families, which are just a tiny bit fancier (now) than the housing built for the defense department and Shipyard employees. Then, the difference was wider, but today, looking at these as potential Officers quarters just soet of makes you do a couple of double takes! It's interesting that the stigma against "prefab" homes was so widespread, but it must have been more of a local or even perhaps regional thing. Because National Homes, based in Lafayette, Indiana, sure did a booming business in just those kinds of homes. There are whole housing developments constructed of nothing else, especially in Lafayette, where my husband and I lived for a few years after we first married and moved to Indiana from Virginia. We actually did live in a home of their making for a while, but it was an apartment complex, not a housing development, that they built in the 60's. We were there in 1978-79, so it wasn't exceptionally old at the time, but they have been torn down and replaced with a much nicer development of apartments and townhomes in the last few years. I know they were still in business when we lived there - it was a common site to see their specialized delivery trucks rolling out of their own intersection with traffic light on the bypass and heading for I65 to go in one of several different directions to deliver more homes. I never had any particular qualms about "prefab" homes, as long as they were well made and constructed out of good quality materials. You could say the same thing about stick built houses too! There were always examples of poorly built, badly designed homes made of inferior grade materials. I live across the street from a whole row of relatively newly built, overpriced, ticky-tacky cracker boxes right now! We watched them being built, we've watched the constant parade of repair crews come and go, fixing or replacing cheap roofs, badly done plumbing, etc. I've been inside a few of them too, and whoever "designed" their kitchens needs to have his/her license yanked because I've never seen a more poorly designed, recklessly arranged room in my life! They would drive me nuts, if I was foolish enough to buy one in the first place. Thanks for your insightful thoughts on the Yates and how it may have been built in phases, Shari.